We offer a full range of property management services tailored to you as an investor, homeowner, or landlord. We have an extensive portfolio of single family homes, townhouses, condos, student housing and apartments in the Harrisonburg and Rockingham County area. We have been serving the Harrisonburg and Rockingham County area of Virginia for 15 years, and have more than 40 years of combined experience managing properties in the same areas. By marketing your rental property to minimize vacancies and maximize income. We know the local Harrisonburg and Rockingham County rental market, what comparable properties are renting for, and what potential renters are willing to pay for each unique rental property. We have the marketing know-how to reach potential renters through a variety of methods and have the experience and resources to help eliminate potential bad tenant experiences. Fill vacancies with screened and approved possible tenants – We handle and coordinate routine repairs as well as emergency repairs, lockouts, etc. Collect rent and track tenant deposits; Comply with federal, state and local laws (VRLTA, Fair Housing, etc); and respond to tenant requests and deal with any tenant issue that may arise. Whether a longtime Riner Rentals tenant or someone actively searching for the perfect new home, you’ve landed at the perfect place. We’re here to make sure that we do all that we can to help you find, qualify for, and move in to your dream rental in Harrisonburg or Rockingham County. We hope you’ll fill out our online application or contact us by email or phone so that we can match you with one of our great rentals in the area. If you’re new to Harrisonburg or Rockingham County, WELCOME! If you’re an area native or have called our area home for years, we’re glad we can help you find a great fit in a great community. We’re proud that our home is/will be your home, too. Let us know how we can help serve you with our local knowledge and local staff who love calling Harrisonburg and Rockingham County home as much as we know you will. Whatever the reason, we’re glad you’re here! 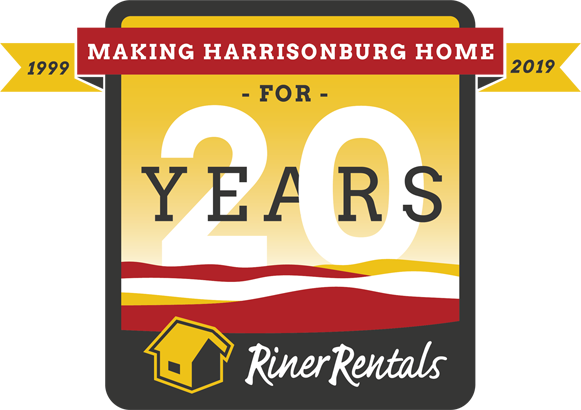 Because at Riner Rentals, it’s not just a RENTAL; it’s HOME. Friendly and easy to work with. Would definitely suggest Riner. I wished I would have started using Riner Rentals years ago. As a property owner they take care of the hassle, are easy to deal with and friendly along the way. Riner is worth every penny. I have been using Riner Rentals for 15 years. They deliver the best service and respond immediately to my requests/questions. I started with Bill Riner and now deal with his son Paul. Just recently I visited their office and was super impressed with the staff and how neat and well organized the office is. It’s always good to see smiles on staff. RINER RENTALS has done a great job keeping my rental property filled and solving all problem as they occur. I greatly appreciate the bookkeeping. It make every thing easier FOR ME at tax time. THANK YOU for a job WELL DONE. Very reliable, dependable. Staff good to work with. I have been VERY pleased with Riner Rentals. This is the perfect experience as an owner looking to rent out the property. Whatever the reason, we love hearing from our tenants, property owners, and neighbors. Just drop us a line and we will be back in touch as soon as possible to answer questions or arrange a meeting or phone call. We really do LOVE to hear from our community of tenants, owners, and friends. Just fill out the simple form here, choose your reason for contacting us, and we’ll make sure the right person reaches out to take care of you. Because at Riner Rentals, it’s not just a RENTAL; it’s HOME. After Hours Drop Box available for rent checks!